(CNS): All three of the Cayman Islands magistrates have recused themselves from hearing the crown’s case against Sandra Catron, a local activist and former political candidate who has been charged with dog theft. Catron has pleaded not guilty to the charges and had requested a speedy trial as the dog in question, which she claims she rescued, is currently being held in a pound at the Department of Agriculture. Catron appeared in court today (Thursday 22 April) but Magistrate Grace Donald said she was conflicted and would have to recuse herself before she adjourned the case for mention next week. Catron, who is representing herself, said as she left the courthouse that she was disappointed her case has been postponed, adding that justice delayed was justice denied. Although no reasons have been offered, the Chief Magistrate Margaret Ramsey-Hale and Magistrate Nova Hall have already recused themselves from this matter as they have stated they are conflicted, and with the third magistrate in Cayman having also now recused herself, Catron’s case will most likely be heard before an acting magistrate. During the brief hearing before the case was adjourned Catron told the court that, despite the fact that she had received documents from the crown pertaining to her case only that morning, she was ready and willing to proceed to trial. She told the court that since the dog was being held in a cage she had specifically said from the moment of her arrest that she expected the matter to be dealt with very quickly. The prosecuting crown counsel in the case, Trevor Ward, told the court the matter had been made ready for trial with significant haste but with the question of the tribunal there was no choice but to adjourn. (CNS): Having arrived on island yesterday the fourteen police officers from the United Kingdom that have been brought to the Cayman Islands to offer temporary support met with senior RCIPS officers this morning to prepare for their new beats. The officers are here to help deal with the recent surge in violent crime, give local officers who have all been working double shifts a reprieve, and to assist in solving the number of outstanding cases. Police confirmed today that the UK cops were from police services in the Staffordshire, West Mercia and West Midlands areas of England. 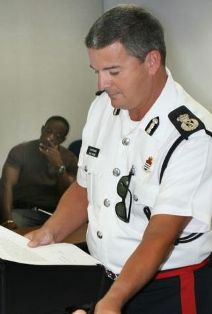 The team was briefed today (Thursday 22 April) and given an introduction to Cayman by senior RCIPS officers. The officers are here at this stage for just a four week detachment to supplement and assist local officers in ongoing investigationsinto serious crimes the RCIPS has said. “These officers hold expertise and experience in a range of policing disciplines,” a police statement via GIS said. The officers were welcomed by Commissioner of Police David Baines, who says he anticipates positive results from their support and interaction with their local colleagues, and with the public in general. The new cops also met with Chief Superintendent John Jones, Chief Inspector Peter Kennett, Superintendent Marlon Bodden and Detective Sergeant Dave Morrison. The commissioner has stressed that the officers are not a task force and are here to help fill personnel gaps until the current RCIPS recruitment drive is complete and the service is closer to being fully staffed. 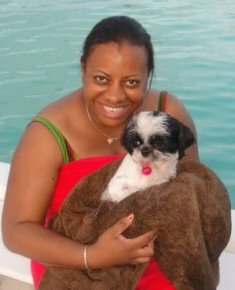 The RCIPS has not commented on whether any of these officer have worked in the Cayman Islands before. Keith Bristow the head of crime business at the Association of Chief Police Officers told the BBC that this was an excellent opportunity for the four West Midlands regional police forces to unite and provide support to the Cayman Islands during a challenging time. "All of our officers and staff are dedicated to protecting people from harm and this is a really positive opportunity to share resources and provide some excellent development opportunities for our officers," he said. (CNS): The Cayman Turtle Farm announced today that it has introduced a new volume discount on turtle meat. Despite recently increasing the price, explained at the time as an effort to reflect the true cost of producing the meat, the farm is now offering restaurants and residents 25 percent discount for bulk buy. All customers, including restaurants, purchasing at least twenty pounds of meat products will be able to get the discount, the farm said in a statement. The farm is also offering the discount on mixed products. The farm said customers buying ten pounds of stew, five pounds of steak, plus five pounds of menavelin will get the 25% reduction. The volume discount price for turtle stew will now be $12.00 per pound, menavelin $9.00 per pound, bones $4.50 per pound and turtle steak $20.25 per pound. Promoting these new volume discounts, Managing Director of the Cayman Turtle Farm Tim Adam said he hoped the discounts on bulk purchases would encourage restaurants to reduce their prices. “We hope they will take advantage of the opportunity to offer turtle meals at lower prices to the general public,” he said. The MD did not say whether the new reduction will impact the sustainability of production, which was one of the reasons cited for the original price increase earlier this year. When the farm announced the significant increases in February, Adam had said the price had been far below the cost to produce it and the facility was constantly losing money as a result. “Looking closely at the farm operations it was immediately clear that the price being charged for turtle meat would not allow the proper operation of the farm. The supply of turtle meat in Cayman is in jeopardy and could dry up in the very near future without significant re-investment in the turtles, their feeding and care or even the farm facilities,” he said at the time, adding that a reasonable pricing structure was the first step in being able to properly re-invest in the farm. (CNS): Despite the pouring rain, 53 swimmers and numerous volunteers turned for Cayman Brac’s 800 metre annual sea swim last Saturday, 17 April. 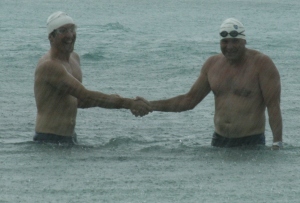 Governor Duncan Taylor (left) finished his first Brac Sea Swim in style, clocking the same time (16:34) as 11-year-old Martha Rivers, who was the first female and the first Bracker across the finishing post, and just one minute behind the two fastest men – Bill McFarland (15.34) and Alex Harling (15.35). Andrea Roach (17.41) and Andrea Aegre (17.44) were second the third women across the line. The Sea swim is the highlight of the year for the Sister Islands Swim Club. Kate Alexander of the Cayman Islands Open Water Committee said, "The Brac Sea Swim was very impressive this year. The weather was terrible, with high wind and driving rain that made it very cold for all the participants. And the logistics of putting together the event were challenging, like trying to keep entry lists and pizza dry! Yet, there was a great turnout, swimmers and volunteers. Michael Hundt, the Brac swim coach, and his team have done a great job in pulling together this swim for the last several years, especially in light of the effects of Paloma." 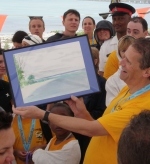 Two prizes of a trip to Grand Cayman for the Flowers 1-Mile Sea Swim were awarded to the 1st Male and 1st Female Sister Islands Residents to complete the race. Rivers, who recently competed in the CARIFTA swimming Championships, and Felix Ebanks will fly to Grand Cayman in June to compete. (AP): A group of federal agencies have issued a report on climate change and health threats looking at what areas need to be studied. "To mitigate and adapt to the health effects of climate change, we must first understand them. This report is a vital new roadmap for doing that," said Jane Lubchenco, head of the National Oceanic and Atmospheric Administration. "There is an urgent need to get started." Published by the National Institute of Environmental Health Sciences, the report concludes that climate will force people, "to negotiate with their changing environment as never before to find ways to reshape it both for short-term protection and long-term alleviation of health consequences." (CNS): The Cayman Islands went into a deflationary phase in 2009 for the first time on record, the Economics & Statistics Office has said. In its most recent Consumer Price Index report, published this month, the ESO reveals that the country’s deflationary position was at its deepest point at -2.9% in September 2009 followed by a slight rebound to -0.6% in December 2009. Prices fell on housing, utilities, fuel, transportation, health and communication. While price deflation in housing softened towards the year end and health and communication rebounded strongly, the average inflation rate for the whole year was -1.3%. Examining the items in the new ESO basket, which was introduced in 2008, the office said that transportation price index fell by8.8 percent due to decreases in the average cost of operations of personal transport equipment and transport services. Prices for housing and utilities fell by 6.4 percent due to the movement in average prices for electricity, gas and other fuels (-33.6%), water supply and miscellaneous (-11.3%). Actual rentals for housing declined by 8.6% but the average cost of maintenance and repair of dwellings increased by 5.9%. The ESO reported that the average price of food and beverage (non-alcoholic) increased by 1.3 percent because of the increase in the price of fish and seafood, which rose by 9.1 percent. Sugar foods also increased by 6.2% but these were offset by the fall in prices of vegetables (-7.9%) and other staple foods. The most depressing point about Mr Iton’s analysis (see Viewpoint below) of the civil fraud charges brought by the US Securities and Exchange Commission against Goldman Sachs is not the tortured misunderstanding of the most basic of principles of the CDO transaction but the inescapable conclusion that the financial services industry in Cayman has clearly failed comprehensively to explain how and why it functions. Let us look firstly at the point where Mr Iton is right, albeit for the wrong reason. There is no doubt that the only progressive route for the Cayman Islands financial services industry is to attract the financial professionals who can undertake the financial engineering of the transactions so that the substantive aspects are undertaken in the Cayman Islands. The Premier has this right in terms of both the necessary amendments to the immigration policy to render the Cayman Islands more attractive in terms of security of tenure for these professionals, and to reverse the rollover policy in relation to the financial services industry. In this way a higher value can be obtained from each transaction by both the public and the private sectors. However it must be recognised that we have a steep hill to climb in terms of the comparative attraction of Cayman. Daily evidence of the failure to understand better the financial industry is itself a major deterrent to attracting the highest quality professionals across a broad range of new disciplines, regardless of how attractive the new immigration policies may be. There is no tax incentive for a US citizen to move (other than State tax) and we are not geographically proximate to the United Kingdom, so on neither ground is the Cayman Islands favoured and nor has it been for the past four decades. As matters stand this necessarily means that the Cayman Islands Government and the local economy must derive its revenue (which currently amounts to over 50 per cent of Government expenditure on the public sector and generally) not from the provision of substantive financial engineering in relation to these transactions, but from ancillary services provided of a legal, accounting and administrative nature and from fees. That fundamental is the one that must be changed if the Cayman financial services industry is to continue to support Cayman Islands Government expenditure. It is by no means a given that it can do so. Now for the points where we do not agree with Mr. Iton’s analysis. The SEC claim is based on civil fraud not criminal fraud and is in the nature of a complaint concerning non-disclosure. There is doubt that the SEC claim is soundly based in law and on the facts and it is vigorously defended by Goldman Sachs. Notwithstanding the vehement denials, informed comment suggests that the claim is politically motivated and it is timed to correspond with President Obama’s support for financial services regulation. To put the issue in context, the claim concerns US$1 billion, or just less than 0.0002% of the dollar value of the structured finance transactions undertaken by Cayman Islands issuers in the past decade. We need to understand that as with any business venture, inherent in the relationships that have resulted in the financial industry having generated billions of dollars for the Cayman Government, is an element of risk. 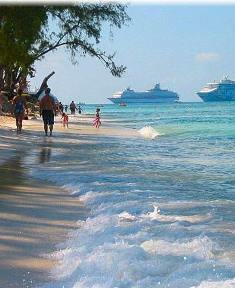 In fact, the Cayman Islands financial services industry has been spectacularly successful in managing that risk. Only the financially naive, or certain British politicians, believe foreign regulators when they attempt to point fingers of blame at the Cayman Islands for their failings in BCCI, Enron or Parmalat. Mr Iton does not understand a derivative CDO trade. There is necessarily a long position that matches the short position. Every CDO transaction must have a winner and a loser. What Mr Iton meant to say was “Heads Iwin, Tails I lose”, which describes perfectly the functioning of a multi-billion dollar marketplace. No investors were relieved of US$1 billion who did not understand that one side would lose. One party to the trade bet that mortgage values would go up and one party to the trade bet the mortgage values would go down. It takes two to tango and it took two to make the bet. At the time Mr Paulson, who was an unknown to Wall Street, was one of the very few persons betting that the trade would go down. It is his role, if any, in the selection of the securities within the portfolio and the disclosure of that role that is at issue. The parties that took the long side of the trade were highly sophisticated and believed the value would go up. No one forced them to take the trade. The long side of the trade knew what securities were in the underlying asset class that comprised the related derivative positions. The issue is simply whether Mr Paulson’s involvement, if any, in the selection of the asset class was disclosed adequately. That is a difficult question for the court and will turn on evidence as yet undisclosed. As a self-interested captain of the financial industry I must repeat my warning that the industry is indeed contributing to the local economy at an optimal level. Mr Iton’s point is a non-sequitur. The start point of the discussion is admirably described in the Miller Report: What is the appropriate level of expenditure by Government for an Island population of 60,000 people? $500,000,000 annually by any comparative standard should have been enough. The financial services industry can only produce what it can produce and it has been seriously hampered both by a short-sighted immigration policy and the external global economic crisis. Even if you do not understand the structuring of a CDO, you should understand that, as any decent tailor will tell you, your cloak must be cut according to your cloth. The issue of the fees that may be charged by the private sector and the Government in the Cayman Islands in relation to any offshore transaction is driven by a number of factors, none of which Mr. Iton describes. There is a balance that has to be struck between the quality of services that we can provide in the Cayman Islands given the available personnel and, given competitive forces, the price that can be charged by the private sector and government in providing them. That is a sensitive economic dynamic that has developed over four decades and one which is constantly under review.At the moment, it should be said, it is a dynamic that is under considerable stress as a result of the recent (and hopefully temporary) fee increases introduced by the Government to deal with the domestic financial shortfall. If and when Cayman can present itself in a better light and attract superior financial professionals, possibly the overall fees charged per transaction may be increased. But that is an analysis that requires a high degree of expertise and understanding not, incidentally, evidenced in Mr Iton’s commentary. A supreme financial services provider, whether a Government or in the private sector, can indeed charge whatever he wants. Those who are not supreme can only charge what the market will bear and need to be happy doing so. When I last looked I saw delusions of supremacy but a shortage of the real thing. This means that the only question for Mr Iton is whether the Cayman Islands Government and the private sector should be in the business of generating fees from financial services on the present basis or not. If the level of outrage at the SEC claim is so great and universally accepted that the answer is that the Cayman Islands financial services industry should not be involved in these types of transactions, we are led to the inescapable conclusion that Mr Iton must immediately find about $250 million per year in revenue from an alternative source. If he does not then the only conclusion is the reduction of the civil service by about 75 per cent. That would be a mistake. Those who agree it would be a mistake must understand that we do not currently have the luxury here and now of faux moral outrage. (CNS): According to a new report on Caribbean Tourism, the decline in the industryacross the region continued throughout 2009 with many destinations seeing further falls. But despite the extremely difficult year for the sector, it also states that some destinations in the region began to recover towards the year end. Arrivals did not grow year-on-year, however, but the pace of annual decline began to slow. Full-year declines were mostly below 10% across the region with a few exceptions, including the Cayman Islands where tourism was down 10.2%. Things were even worse for Grenada, with a 14.4% drop in arrivals and Montserrat with a 17.4% drop. Some limited arrivals growth was experienced in countries such as Jamaica 3.6%, Guyana 5.7%, Cuba 3.3%, Curaçao 0.4% and the Dominican Republic 0.3%. The authors of the Caribbean Tourism Market Report said the slowing of the decline at the year end was probably due to the traditional increase in visitor arrivals following the end of the hurricane season in November and the holiday season around Christmas and New Year. The reports forecasts that this is likely to continue in 2010 and arrivals may begin to return to growth early in the year, partly rebounding from the sharp declines of Q109. Ongoing recovery will be dependent on the pace of economic recovery in the US, the Caribbean’s major tourist market. Preliminary figures for 2009 indicate that arrivals from the US to most Caribbean islands slowed significantly over the year, particularly in countries such as Anguilla (-24.3%), Montserrat (-21.4%) and St Vincent and the Grenadines (-18.8%). Meanwhile, a recent UN World Tourism Organisation report predicted that the global tourist industry should recover strongly in 2010 after the economic crisis and the swine flu pandemic had produced "one of the most difficult years" for the sector. Around the world tourist arrivals fell by an estimated 4.0 percent in 2009 but should rebound to grow by 3.0 in 2010, it said in its annual World Tourism Barometer. He warned countries against premature withdrawal of stimulus measures that were helping the recovery and the temptation to impose extra taxes may jeopardise the pace of rebound. The UN found that in the Americas, where arrivals were down 5.0 percent, the Caribbean returned to growth in the last four months of 2009. (ZEENEWS.COM): As the world observes Earth Day Thursday, there is not much to cheer for the coastal communities whose primary source of livelihood — mangroves is under threat due to unchecked anthropological pressures and natural calamities. 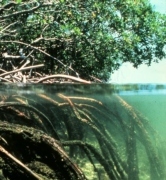 The International Union for Conservation of Nature (IUCN), a network of several conservation groups, has set alarm bells ringing by warning that more than one in six mangrove species worldwide are in danger of extinction due to coastal development and other factors, including climate change, logging and agriculture. Mangroves are salt-tolerant plants of tropical and subtropical inter tidal regions of the world andare extremely delicate and fragile. (CNS): The last minute scrambling to put together a three year plan and the 2010/11 budget is a result of a wasted first year in office by government, a member of the opposition has said. Former Cabinet minister Alden McLaughlin told CNS that it was a shame that the premier had not chosen to take a longer view of the country’s financial future and enter into negotiations with the UK when first elected to office instead of bringing a pretend budget then subjecting the country to a yo-yoing of decisions. He said that on the eve of the UDP’s second budget the country was still very unsure about its short and long term financial future. McLaughlin said the UDP government may have announced its intention to cut operating expenditure but following bold announcements about cutting salaries and benefits nothing had happened. He said even the MLA salaries have not been cut, despite an announcement to the parliament and the country. He said that again in the latest announcements about spending the government had asked for cuts but left the decisions in the hands of the civil service, who had been told that cuts were needed and they needed to figure out what to do. McLaughlin said the disadvantage for the opposition was that it no longer had access to government figures, but they believed from the information that they had received that the deficit was worse as a result of the pretend budget, which gave a distorted impression to the civil service that all was well. “The last year has been wasted when the country could have been further ahead with a longer term financial plan and as yet none of the fundamental issues have been addressed,” the former minster said. The Legislative Assembly is expected to resume next week as according to the PMFL government must table its budget before 1 May.